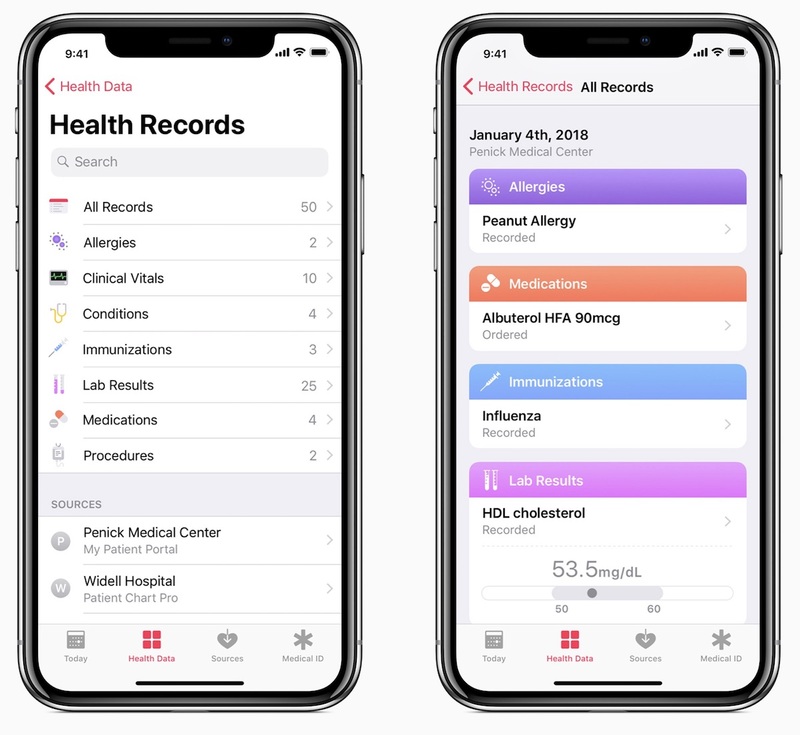 Apple today revealed an update coming to the Health app in the iOS 11.3 beta, which will bring a "Health Records" section to the app and allow users to see their medical records from various providers. The updated Health Records area will combine hospitals, clinics, and other information from Health "to make it easy for consumers to see their available medical data from multiple providers whenever they choose." Some of the first provider partners include John Hopkins Medicine, Cedars-Sinai, Penn Medicine, and various other hospitals and clinics. Apple explained that the update is intended to serve as a consumer-friendly solution to easily access medical records, which were previously housed across multiple websites and online repositories. The company said it created Health Records based on Fast Healthcare Interoperability Resources (FHIR), which provides the standard for transferring electronic medical records. Health Records will provide an overall view of a user's allergies, conditions, immunizations, lab results, medications, procedures, and vitals. The Health app will also now notify them when their Health Records data is updated, which is encrypted and protected by the iPhone passcode as well. Apple today also previewed iOS 11.3, stating that iPhone users will be able to view battery health and disable Apple's power management when the update comes out this spring. The hard part I'm afraid is convincing providers to participate. I track several metrics for my health and try to show the data to my physicians. They have little to no interest because I generated the data. This addition will hopefully help things since the data in records should come from them and other providers. It would be nice if my test results would simply appear in the app and notify me they are ready to view. A provider who doesn't want to look at user generated data is equivalent to a provider who doesn't want to listen to you if you say something's wrong. You might want to consider switching. Same and while that machine was connected to me, I checked its bpm with the one my Apple Watch says. it was 1-2 off, so pretty accurate for a long term review of the data it collected. For me the problem is I sometimes get 120+ BPM while sitting for no apparent reason and the Apple Watch warns me about that. During the check up my doctor did, everything was fine. I am really concerned not being taken seriously. In May last year I had chest pain (cause of some dumb **** I tried - codeine) and thought I'm going to die. And since then these warnings from the Apple Watch appeared. If you are having the “high heart rate while resting” alerts, you should ask a cardiologist to place an event monitor on you. Also consider enrolling in the “Apple Heart Study” where a potential arrhythmia seen by the Apple Watch is then checked (for free) by an event monitor that is mailed to you. They looking to expand the Health Records section even when they don't even have the basics covered in Results? Why, after several years, can I not track my blood cholesterol levels? I don't get it; this has been suggested since it was released 3+ years ago. I can track my "Electrodermal Activity" easily. But not cholesterol. That alone makes Health not useful for many (at least, as an all-in-one place to store all your health info, as promoted), no matter how much they improve the other aspects. I'm really looking forward to 10.3. Most of the time X.3 updates the OS gets really good (read: less bugs). Also let's pray for iMessage in iCloud. If anyone knows someone at apple or in the FHIR community working on or familiar with this project - we'd love to connect. We have 10K patients that would love having their data in iOS's Health app. We have a full-stack development team as well. Looking for documentation and introductions! I hope the actual health app gets revised as well. It was superb, everyone was viewable on the same screen and then it changed to the total cluttered garbage it is today! I didn’t check all of the listed hospitals, but Hopkins, Penn and Cedars-Sinai all use Epic for their EHR (as do 11 of the top 12 US hospitals by US News & World Report). Epic is probably the lead at sharing info, as it already shares info among other Epic-using hospital systems as well as some other competing EHR’s (e.g., Athena). If Apple Health links directly to Epic, that would cover many of the US academic hospitals. MedStar uses Cerner EHR (the overall marketshare leader) so that shows that Apple Health can talk to more than one EHR - even though Cerner can’t talk to Epic (yet). I would like to see my health information on my iPad. Very good stuff Apple! I really enjoy poring over the details of my health app. I don't even know why.... I'm not a health freak and I don't diet or anything like that.... I just have an Apple Watch but looking over how far I walk in a day, how many flights of stairs I climb.... very very interesting! It seems the data is there and now I'm looking for smart ways to interpret it such as how much does hot weather affect me? Or more pressing info like is there a period where my heartrate changes or it takes longer to recover to the resting rate. Imagine that. For a data nerd like me that would be heaven.